The states where maximum constituencies will be voting in the phase are Andhra Pradesh and Telangana with 25 and 17 Lok Sabha seats respectively. Ninety-one constituencies in 20 states and union territories will be going to vote in the first phase of Lok Sabha election on 11 April. The states where maximum constituencies will be voting in the phase are Andhra Pradesh and Telangana with 25 and 17 Lok Sabha seats respectively. The others states and union territories which are going to polls in this schedule are: Arunachal Pradesh (2), Assam (5), Bihar (4), Chattishgarh (1), Jammu and Kashmir (2), Maharashtra (7), Manipur (1), Meghalaya (2), Mizoram (1), Nagaland (1), Odisha (4), Sikkim (1), Tripura (1), Uttar Pradesh (8), Uttarakhand (5), West Bengal (2), Andaman and Nicobar (1) and Lakshadweep (1). 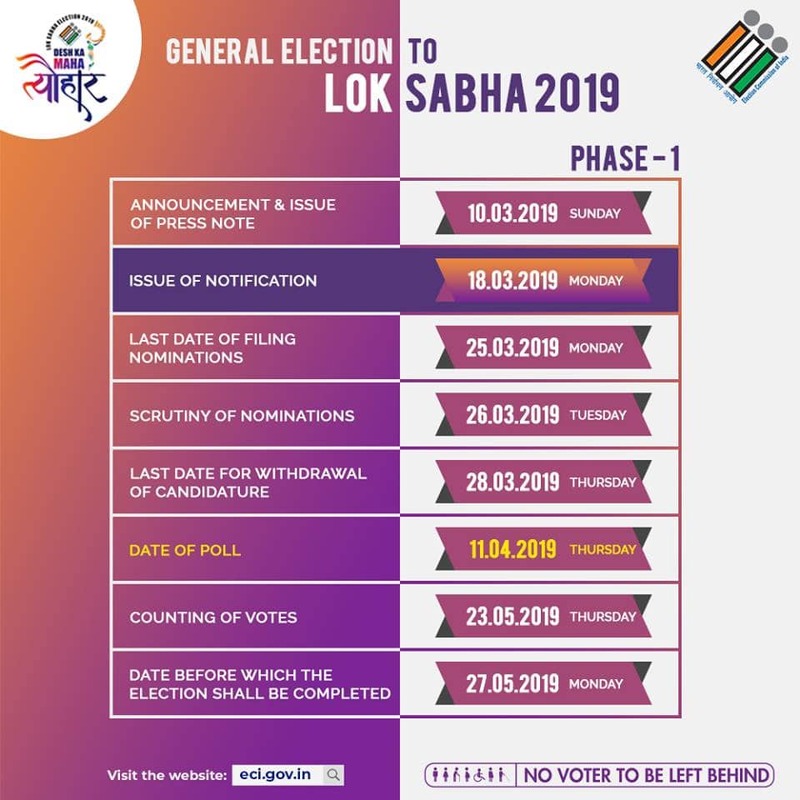 Assembly elections in four states – Andhra Pradesh (all 175 constituencies), Odisha (28 of total 147 constituencies), Sikkim (all 32 constituencies) and Arunachal Pradesh (all 60 constituencies) will also take place along with the Lok Sabha election in phase 1. The votes would be counted on May 23. The next of the 7-phase polling dates are April 18, April 23, April 29, May 6, May 12 and May 19.